Grace Bible Fellowship has been participating in Operation Christmas Child for over 10 years now and is a designated drop-off point in Rockland! 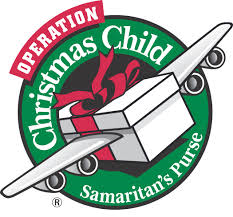 What is Operation Christmas Child? It’s an opportunity for individuals & families to pack a shoebox with gifts & items in need to be given to children all over the world, along with the Gospel message! Read below for more information about the program, and what Samaritans Purse is doing RIGHT now in the world! Collection of shoeboxes is in NOVEMBER,so start collecting items now! Shares the Good News of Jesus Christ. As shoebox gifts are distributed, local pastors or church leaders present the Gospel in a fun way designed for kids while family and friends listen in. Along with their shoebox gift, children also receive The Greatest Gift, a colorful presentation of the Gospel in their own language. Blesses children with joy, hope, and love. Their shoebox is the first gift many children have ever received! The treasures and personal letters inside communicate that someone cares for them and give them an opportunity to experience the love of God. Multiplies as children share their faith with friends and family. Even before The Greatest Journey course is over, students begin witnessing to others. Then at graduation, the Gospel is shared with their friends and family again. The graduates also receive a New Testament to use personally and in communicating their faith to others. Makes disciples through the local church. After receiving shoebox gifts, boys and girls are invited to enroll in The Greatest Journey, our 12-lesson discipleship program. They learn from trained local volunteers what it means to faithfully follow Christ and share their faith with others. Grows congregations and plants new churches worldwide. Through the efforts of local believers on our National Leadership Teams, entire communities are being evangelized as shoebox gifts are delivered. Some of these areas do not have any existing church. Our staff and local partners will be meeting urgent needs in Hungary and other affected European countries. Hundreds of thousands of refugees desperate to start new lives in the West have rapidly streamed through Europe this year, overwhelming certain nations along their path. It is the largest crisis of its kind in the region since the Second World War. Many of these men, women, and children are in a mad scramble to transit through the Balkans and Hungary in search of better opportunities—sometimes exiting countries in less than 24 hours. Samaritan’s Purse has deployed a multinational team of personnel to Hungary, Serbia, and other affected countries to meet the immediate needs of displaced people. We are supporting trusted, local Christian partners with the aim of facilitating as many intersections between them and refugees as possible—offering a variety of physical relief and the hope of the Gospel of Jesus Christ. 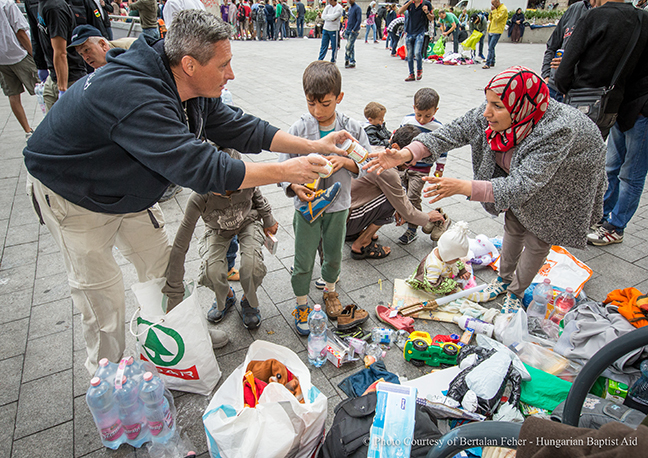 Samaritan’s Purse is working with partners in Hungary and Serbia to distribute needed relief, including food and hygiene items, to refugees fleeing the Middle East. A Samaritan’s Purse staff member (in red) listens as young men share their journey from Iraq to Europe. A typical route takes refugees—many from Syria, Iraq, and Afghanistan—by land or sea to Turkey and/or Greece, then through the Balkans and Hungary, and then onto Austria, Germany, the United Kingdom or other northern European nations. Well over 4 million refugees have fled Syria since violence erupted in the spring of 2011. The German government has in recent days said it will take in up to 800,000 Syrian refugees this year. The United Kingdom has also said it will take in 20,000 refugees over the next five years directly from camps on the borders of Syria. Well over 4 million refugees have fled Syria since the start of a civil war that is now more than four years old. The video below is from a bridge into the town of Gevegelija, Macedonia, just across the border from Greece. The refugee-processing center is on one side of the bridge, and the town is on the other. In a recent 14-hour period, approximately 4,500 refugees crossed the border. Due to the situation on Lesvos in Greece, Samaritan’s Purse predicts that approximately 20,000 refugees will attempt to cross the border in the next few days. Current conditions on the Greece-Macedonia border are cold and rainy. Infants are wrapped in plastic bags to protect them from the rain. Clothing is inadequate even for current temperatures, much less dropping temperatures that will follow in the next few weeks. Soon it will not be possible for people to sleep outdoors as they will be at significant risk of hypothermia, particularly infants, young children, and the elderly. Please pray for the safety of those moving through Europe now, and ask God to bless our work as we seek to provide physical relief and share the love of Christ with them. Please pray for wisdom for Samaritan’s Purse staff around the world as our response continues to develop. Finally, pray for our personnel on the ground and those who will be joining them shortly.